I liked the sound of the suggested additions but considering I’ve not had much fudge success I decided to keep it simple. I didn’t have granulated so just used caster sugar, it does say earlier in the chapter that you can use either. 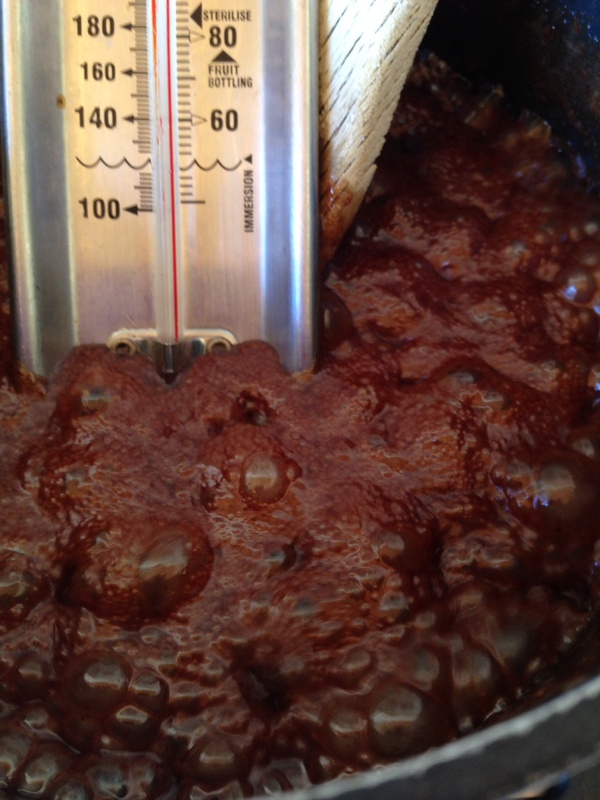 The first part is easy enough and reckon it was boiling for about 10 minutes before it reached 240. The smell was great as it was boiling away.. 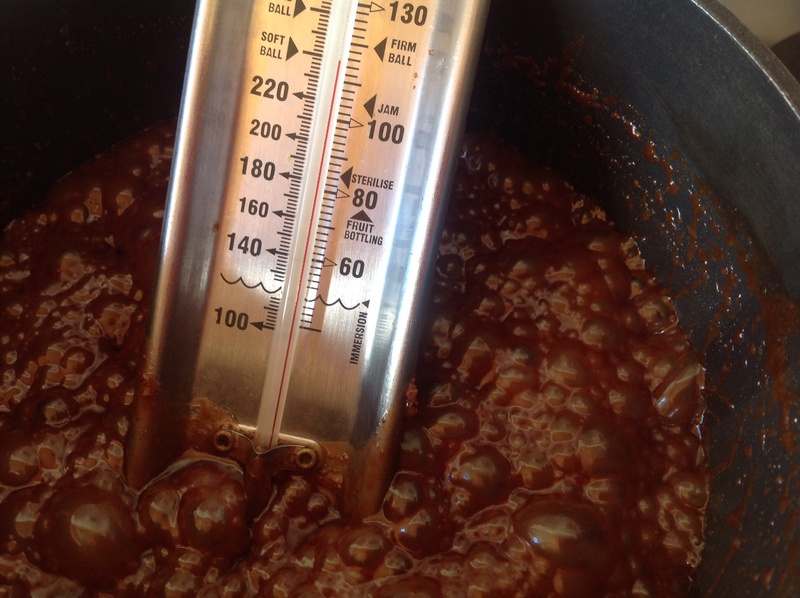 I have a very handy sugar thermometer so know when it’s at the right temperature, but you can use the test of dropping a small amount in cold water and it should form a soft ball that flattens when you press it. Then I started the beating stage. The consistency does change quickly and becomes really thick and creamy looking, and I was tempted to stop now but I couldn’t feel any grains..
Then it does start to change again and can feel the grains so I transferred into my tin. The minute it hit the tin it was becoming quite solid so was now worried I had beat it too much again and was going to heading towards tablet again! I left it for a while then cut into cubes, well I tried to cut into cubes. 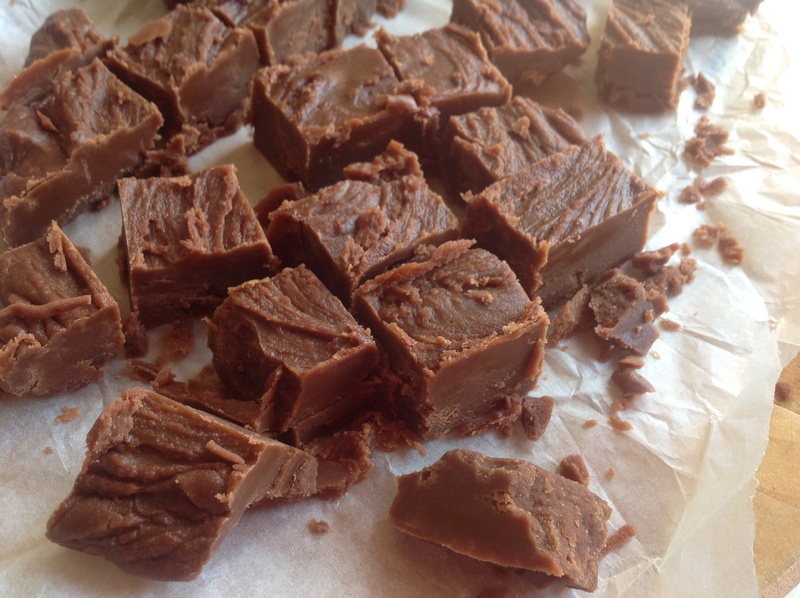 It was a bit crumbly in places so didn’t get nice clean cubes like I imagine you should with fudge! Well it tastes great!! 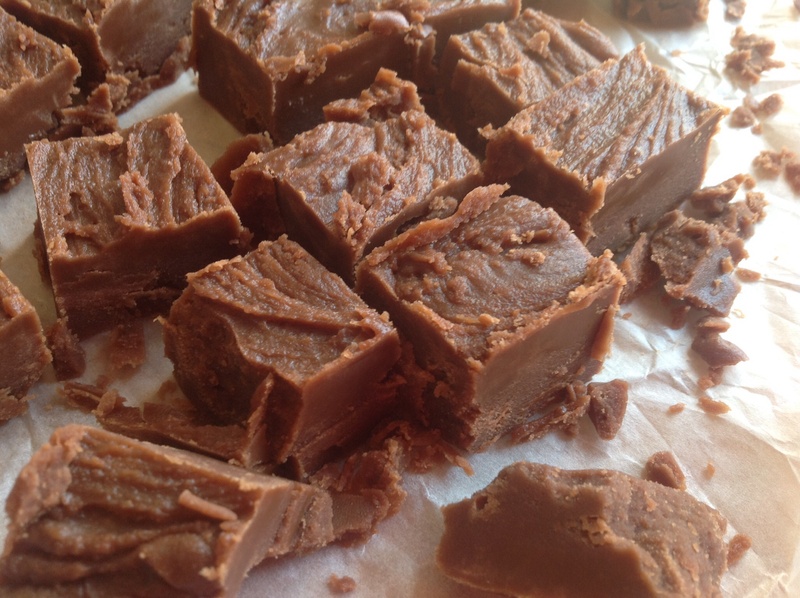 It’s a lovely chocolate fudge/tablet! 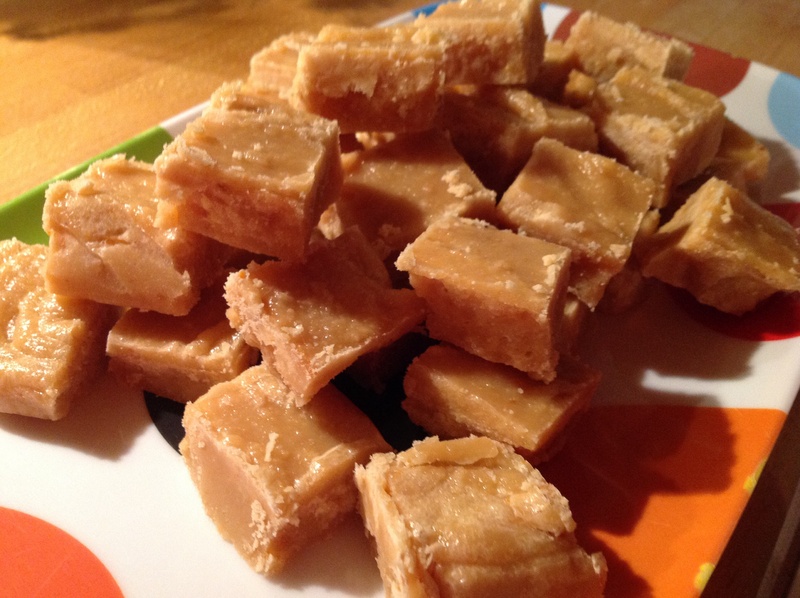 It’s a bit hard to call a fudge but not quite hard enough to be tablet! So next time I think I will stop beating a bit earlier. 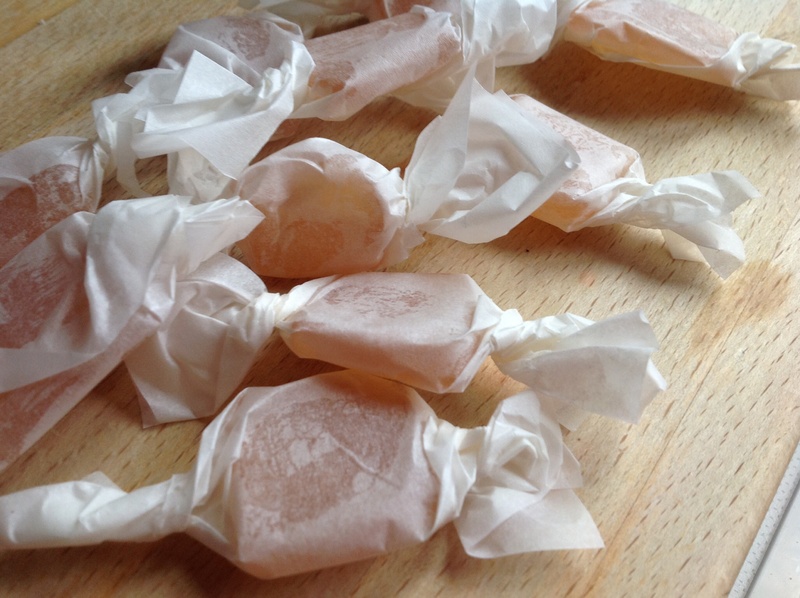 I made this for my gran and we all had a taste and was liked by everyone, it’s just not the right consistency. So the plan had been to make these for my mum for Mother’s Day, they didn’t quite go to plan so fortunately I had made brownies as well.. I have made a couple other recipes from this chapter and neither of them went particularly well! 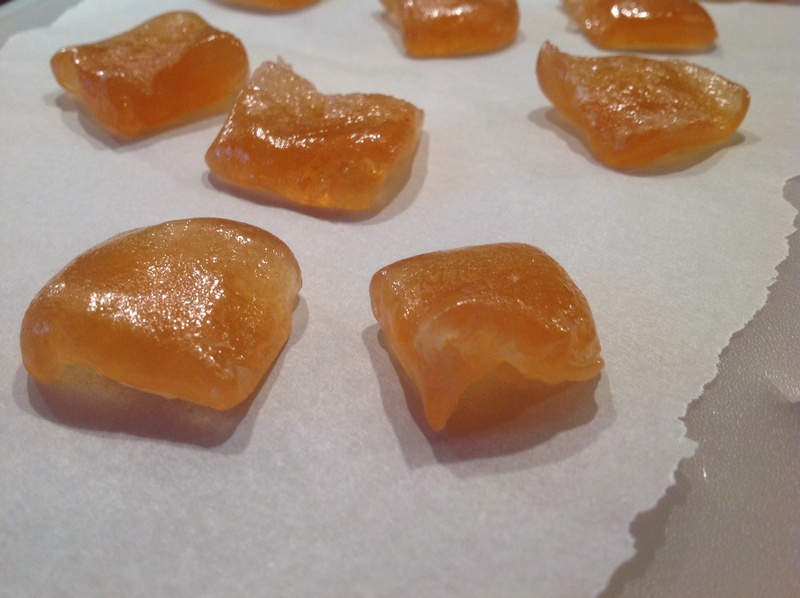 The vanilla fudge was a sticky mess and then the orange fudge was more like a tablet! So I was hoping take three would be more successful! I was surprised that there was milk in this, and was hoping this would make it nice and creamy. The whole boiling stage took about 20 minutes, it’s always the last few degrees that takes so long. At this point it was looking nice and golden, I just had to wait to cut it. I wrapped them in pieces of greaseproof paper to try and make them look half decent! So I had to try these before I gave them to my mum, and yes they do actually taste nice but they are so so sticky. It’s more like a toffee! Had to warn my mum not to chew them unless she wants to loose a filling!! I have no idea if it’s meant to be like this, I wonder if maybe I did over boil. 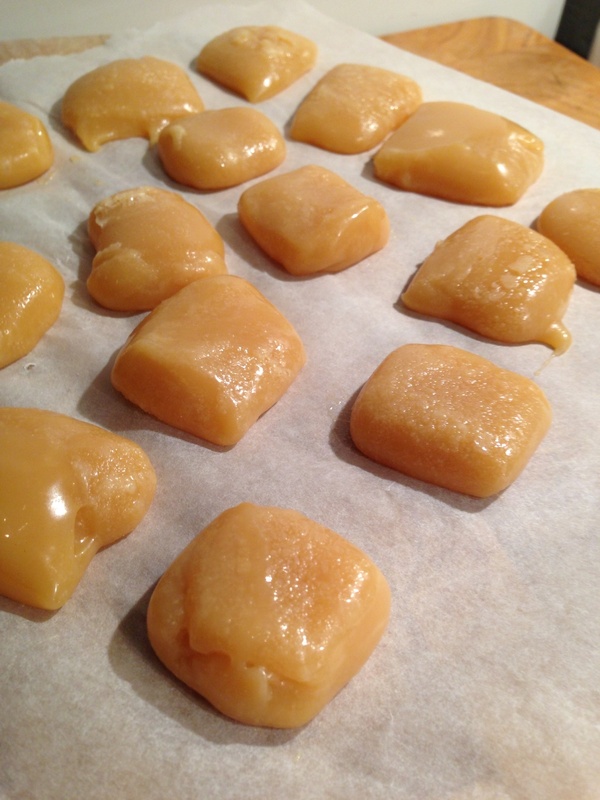 I’ll need to try the actual toffee recipe to see how that turns out and compare to this. Would I make these again? Maybe, if I needed a dental extraction I could use a piece of this! Put the sugar, milk and butter into a saucepan and heat slowly until the sugar has dissolved. Add the orange rind and juice, bring to the boil and boil steadily to 240 degrees, stir frequently to prevent sticking. Remove from the heat, place the pan on a cold surface and beat until thick, creamy and beginning to grain. Pour into a tin 12×4 inches and leave until nearly cold, then mark into squares; when firm cut with a shape knife. I have a sugar thermometer so easy enough to know when it’s reached the correct temperature. If you don’t you are looking for the soft ball stage. I think it took about 15-20 minutes of boiling for it to reach the correct temperature. So I did not beat for long enough last time as I didn’t get any grains appearing when beating. So this time I made sure I gave it a good beat and eventually it went nice and thick and grains did appear. 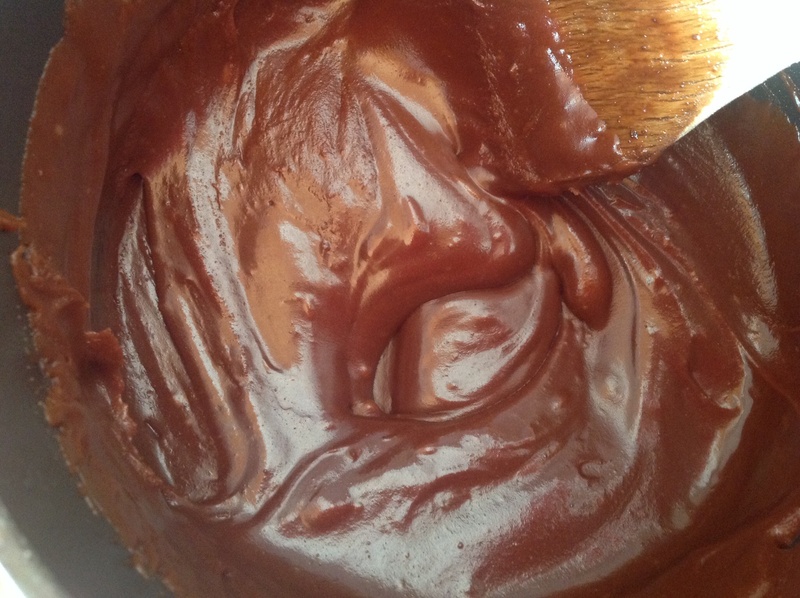 Have to say one of the perks of making fudge has to be licking the pan! At that point it tasted good. I left it for about 15 minutes before marking it and then another 2 hours before I actually cut it into squares. So this has turned out a bit more like tablet than fudge!! I was expecting soft, creamy fudge, but I have hard tablet like stuff. So I think this time I may have over beaten?! 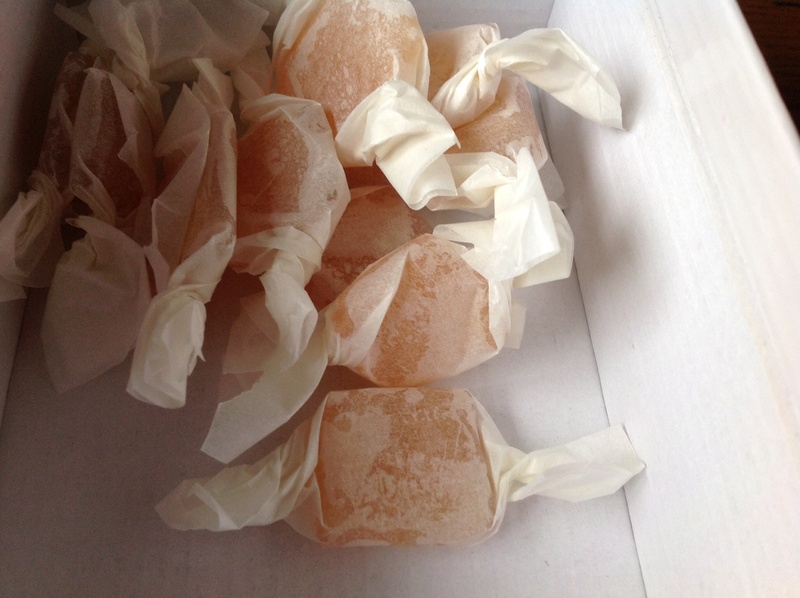 It is really tasty though, ridiculously sweet. The orange flavour isn’t as strong as I’d expected, it is a really nice flavour but I would be tempted to add more orange next time. Have made this as a present for my gran so hope she likes it, her tablet is legendary so this has a lot to live up to. Thought I’d pick something from the homemade sweets section, so have chosen the most basic to start off with. Put the sugar, butter and both milks in a heavy based saucepan and heat gently until the sugar has dissolved and the butter melted. Bring to the boil and boil steadily to 240F, soft ball stage, stirring occasionally. Remove from the heat, place on a cool surface, add the vanilla and beat until the mixture becomes thick and creamy and ‘grains’ – ie until minute crystals form. Pour it into a 6 x 8 inch tin. Leave till cold then cut into squares. Make sure to use a deep pan for this, I took my eyes off it for a while and it nearly boiled over the top! It doesn’t tell you how long it takes to reach the soft ball stage. I have a sugar thermometer so was easy to know when it was ready. If you don’t have one then you need to do the soft ball test using a glass of cold water. I reckon it took a good 20 minutes of boiling for the mixture to reach the correct temperature. I have to say I didn’t get the whole grain/minute crystals, I followed the instructions and was beating for about 5 minutes then I just poured it into the tin. It took a while to set, while I was waiting I had the saucepan and spoon to lick!! Once cooled I just cut into rough squares. It tasted great, ridiculously sweet but guess that’s to be expected with all that sugar. I felt it was more like a caramel than a fudge. You do need to be patient with this, and that’s where I definitely went wrong. I had put it in the fridge to set but was still quite soft when I cut it so nearly ended up with a sticky mess! There are quite a few flavoured fudge recipes in the book so definitely looking forward to trying them. Would I make it again? Probably, am definitely going to be trying the flavoured fudges, this one is so sweet, so hoping the addition if a flavour will distract from that.